A landmark four-part series, THE RISE AND FALL OF JIM CROW explores segregation from the end of the civil war to the dawn of the modern civil rights movement. Lynchings and beatings by night. Demeaning treatment by day. And a life of crushing subordination for Southern blacks that was maintained by white supremacist laws and customs known as "Jim Crow." It was a brutal and oppressive era in American history, but during this time, large numbers of African Americans and a corps of influential black leaders bravely fought against the status quo, amazingly acquiring for African Americans the opportunities of education, business, land ownership, and a true spirit of community. The premiere episode begins with the end of the Civil War and Reconstruction, periods that held so much promise for free black men and women. But as the North gradually withdrew its support for black aspirations for land, civil and political rights, and legal due process, Southern whites succeeded in passing laws that segregated and disfranchised African Americans, laws that were reinforced with violence and terror tactics. By 1876, Reconstruction was over. 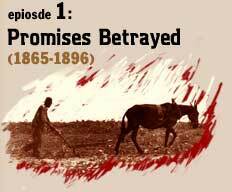 "Promises Betrayed" recounts black response by documenting the work of such leaders as activist/separatist Benjamin "Pap" Singleton, anti-lynching crusader Ida B. Wells, as well as the emergence of Booker T. Washington as a national figure. 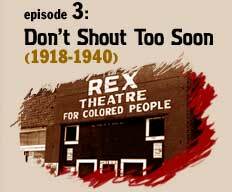 The second episode explores the dramatic rise of a successful black middle class and the determination of white supremacists to destroy this fledgling black political power. Through the efforts of men and women like educator Charlotte Hawkins Brown, African Americans continued to move forward. Black artists created new genres of American music and an intellectual elite, personified by the pioneering W.E.B. Du Bois, emerged. Du Bois, a charter member of the newly founded National Association for the Advancement of Colored People (NAACP), was the editor of its magazine, THE CRISIS. 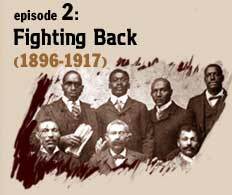 This episode ends with the violence at home giving way to warfare abroad as thousands of black Americans depart for World War I. Episode 3 chronicles the years between World Wars I and II, a time of increased mob violence, lynchings, and massacres of blacks. White supremacy was kept in place by terrorism,but three men, each part of the fledgling NAACP, led campaigns to confront these threats. W.E.B. Du Bois called for veterans of World War I to "return fighting." Walter White went among the lynchers to discover the truth behind the rapes and insurrections allegedly committed by blacks, and Charles Hamilton Houston designed and successfully applied a legal strategy that challenged Jim Crow and resulted in the famous "Brown vs. Board of Education" decision, which desegregated public schools in 1954. 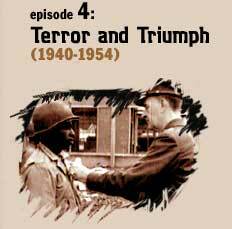 The final episode, "Terror and Triumph," examines the surge of black activism that took place after World War II. Prolonged legal battles led to Supreme Court decisions that opened doors and restored voting rights for blacks. The battle for freedom, dignity, and opportunity throughout America continued through the '50s and '60s -- and in many respects, continues today. To order the tapes for educational use, please contact California Newsreel: 877-811-7495. Off-air taping rights for THE RISE AND FALL OF JIM CROW are avilable to educators for one year following each broadcast release.